The Solaris Editors' Blog: Witchbreaker Out Now! 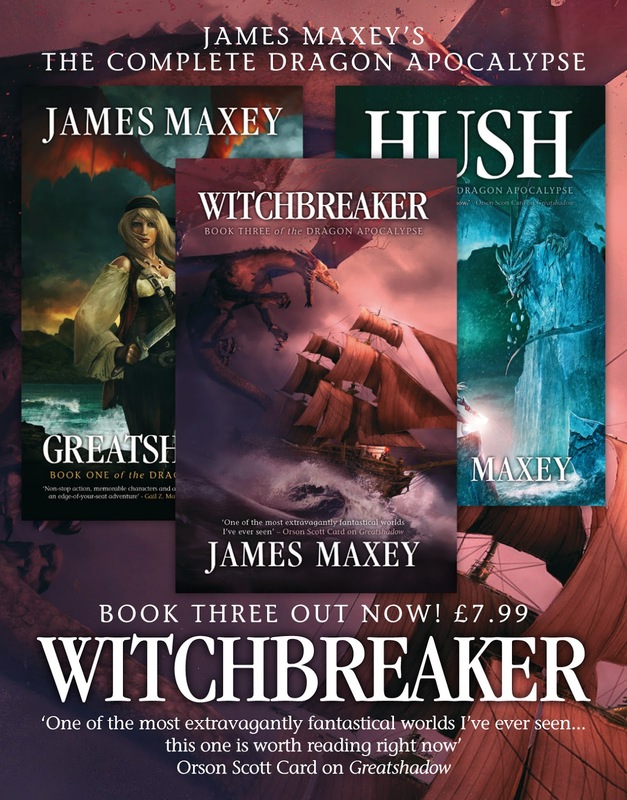 What better way could there be than spending Christmas day with Witchbreaker, the climax to the most Glorious fantasy series of 2012! Out in North America today, and in the UK on January 3rd, but on ebook everywhere now!). 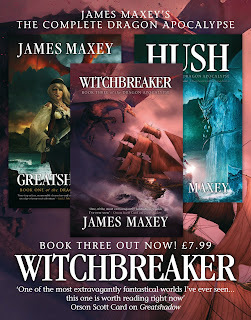 Since the first book, Greatshadow, was released at the beginning of the year James Maxey’s series has garnered praise from the highest quarters. Orson Scott Card wrote a blog about how great it was. We think it’s the most entertaining romp of a fantasy you’ll have read since The Princess Bride. A cast of incredible characters and a plot that is so unpredictable and yet so very entertaining (it’s impossible to say much without spoilers, but the end of book two, Hush, oh boy!) This has to be read to be believed. The series has had everyone who’s read it desperate to know how James Maxey could possibly cap it all off. Well wait no Longer! Here’s the blurb for Witchbreaker, which we’ve tried to keep spoiler free, but if you haven’t read books one and two, waste no time. This is what the holidays are for! Long ago, Lord Stark Tower – the famed Witchbreaker – nearly wiped out the witches. Today, only a handful of women still practice the weaving craft in secret. The witch Sorrow, Infidel’s fellow adventurer, has vowed to right this wrong, crushing the Church of the Book and launching a new golden age of witchcraft. In pursuit of her goal, she has bonded her soul with Rott, the primal dragon of decay, giving her near-limitless powers of destruction. Unfortunately, this power has cost Sorrow her humanity, leading her to a desperate quest to find the greatest witch of all time, Avaris – rumoured to still be alive after hundreds of years – in hopes of mastering her dark magic before it destroys her. But she’s not alone in hunting Avaris, as fate throws her into an uneasy partnership with a man who wants to be the new Witchbreaker. Can either of them survive their mutual quests when their journey leads them into battle with Tempest, the primal dragon of storms?